Pastrami is one of the most popular preserved meats. Pastrami is preserved in much the way that meat has been for thousands of years: in a salt mixture to prevent bacteria from growing. The great thing about pastrami is that it, like ham, it also tastes great smoked. Pastrami starts with corned beef (salted beef with spices) and is then smoked to add flavor and aid in preservation. The basic method for making pastrami from scratch is to start with a mostly trimmed beef brisket. If you buy a trimmed brisket at the store or from your local butcher, it will have no layer of fat on it. For the best results, it is best to have a very thin layer of fat on your brisket to make pastrami—about 1/4 inch. This means separating the flat and the point. For those who don't have a lot of experience with brisket, a whole brisket is actually two pieces of meat separated by a thick layer of fat that is referred to as the flat and the point. From this point, you need to corn the beef. This is done in several different ways. The easiest and safest, in my opinion, is to use a brine. The salt-water brine preserves the meat and gives it the texture that we would call corned beef. The basic brine consists of water, enough salt to float an egg, and seasonings like black pepper, coriander, juniper berries, and garlic, among others. People who make their own pastrami usually end up with a recipe unique to them. The beef brisket should remain in the brine and be stored in a cold, dark place for anywhere from seven days to three weeks. You do need to regularly check on the meat and turn it to prevent spoilage. Once you have corned beef you need to rinse off the meat. If you have brined it for a long period of time (a week or more), you might want to soak it overnight in fresh water to lift out some of the salt. Now, apply a rub and place it in a smoker. 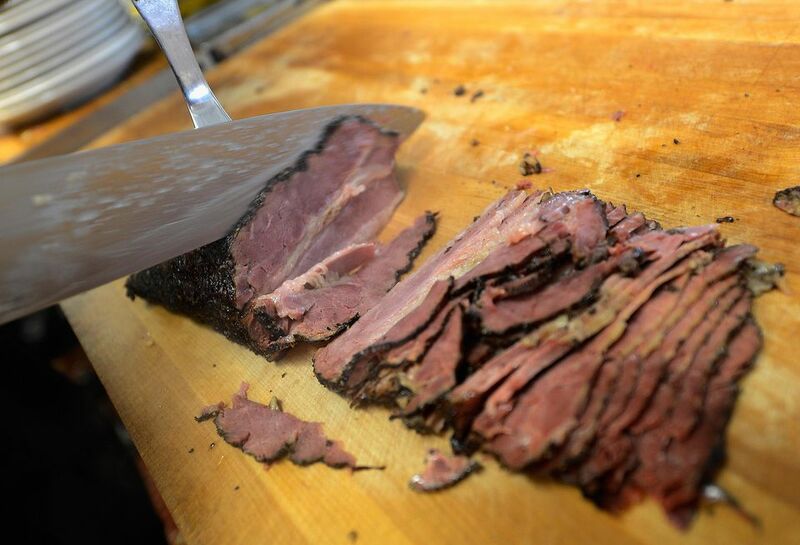 The old-fashioned way of preparing pastrami is to cold smoke it. This will give it a more pastrami-like texture, but not that many people have the smokehouse to do this. A modern, "hot" smoker will do the trick. Smoke your brisket for about 45 minutes to an hour per pound. Keep this part in mind when selecting a brisket. A 10-pound brisket can take 10 hours to smoke. Once the meat has reached an internal temperature of 165 F (75 C), it is done. You do not need to smoke pastrami as long as you would a regular brisket. The long brining time will make the meat tender. Homemade pastrami is one of those things you need to be careful with. Because you cure the meat for a long period of time, the risk of spoilage is high compared with other smoked foods. Make absolutely certain that everything that comes in contact with the meat—including your hands and other utensils—is very clean. Make careful observations of the meat during the whole process, and make sure that every inch of the meat reaches 165 F (75 C) before you remove it from the smoker. Pastrami is kind of a hobby, so experiment to find out what works best for you. We guarantee that once you've found your method, you'll never return to store-bought pastrami again.